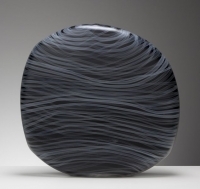 Inspired by experiences in the natural world for many years now, Clare Belfrage has forged an international reputation for her distinguished work with detailed and complex glass drawing on blown glass forms. She has maintained a vibrant practice for thirty years. 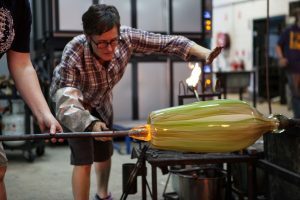 She has been an active part of artists’ communities particularly in Adelaide and Canberra, including the glass based studio blue pony, of which she is a founding member, the JamFactory Glass Studio in Adelaide and, Canberra Glassworks where she played the pivotal role of Creative Director from 2009 to 2013. Clare has had a long involvement in education and has lectured in the glass programs at the University of South Australia, SA, and Ohio State University, USA and Curtin University, WA. She has also taught numerous workshops throughout Australia, New Zealand, Japan and the United States. In addition to Australia, Clare regularly exhibits in North America, Europe, Hong Kong and New Zealand. 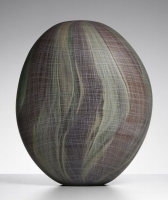 Her work has been recognized for its innovation and originality and in 2005 and, 2011, she was awarded the Tom Malone Glass Prize by the Art Gallery of Western Australia. 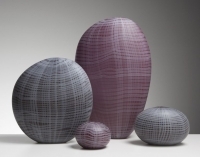 In 2016 she was awarded the inaugural FUSE Glass Prize for Australian and New Zealand glass. In 2018 Clare will be the South Australian Living Artists festival feature artist with a monograph on her career and artwork to be published. Clare’s work is represented in major public collections including: National Gallery of Australia, Canberra, Corning Museum of Glass, USA, Museo do Vidro, Marinha Grande, Portugal, Tacoma Museum of Glass, USA, National Art Glass Collection, Wagga Wagga, ArtBank, NSW, Art Gallery of South Australia, Art Gallery of Western Australia, Museum and Art Gallery of Tasmania and Northern Territory Museum.